PeaZip Portable is the ideal package when you want to use a free file archiver and compressor utility without modifying your system, either because you prefer native portable software as replacement of installable software, or you need to bring it with you on an USB stick, or when you cannot modify the machine you are working on, or if you just want to try it without installing anything on the system: simply extract and use PeaZip, and simply delete its folder to remove the application. Unlike most of other classic file archivers like WinZip and WinRar, PeaZip is structured as a frontend for multiple tools. 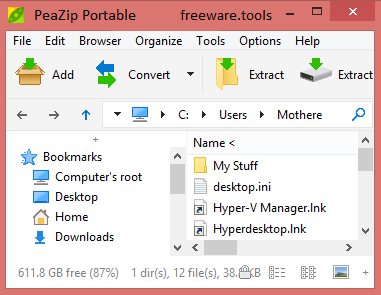 PeaZip Portable is a simple, user-friendly compression utility that provides support for multiple file formats, such as ZIP, TAR, 7Z, GZ, CAB, SFX, GZIP and more. The application integrates perfectly with Windows, thus offering you easy and fast access to archiving options, directly from the context menu. The main interface enables you to browse for the files and folders you want to compress and create the desired archive with just a few clicks. Also, you can add files to an already existing archive, password-protect compressed files, use the TAR method before compression, as well as send the output by mail.